These capsules can be used with compatible dolce gusto® coffee maker. 1, coffee powder thickness like as Nestle Dolce Gusto capsule, can be thicker than the Nestle Dolce Gusto capsule coffee powder a little. Coffee powder uniform particle.Before use it,make sure the steel capsule clean.The crevice in the bottom,no coffee powder.Check method:put water in the steel capsule body,the hole in the bottom of the body,the water flows continuous. 2,around the lid,have a hole,near the hole,you see a triangles,help us make sure the position. When you encounter these situation,you must use filter:you use illy coffee grind,you use extra fine grind,the machine come a little coffee,or do not come coffee.you must use the filter. Put the filter under in the steel capsule,fill into coffee powder,tamp the coffee hard ,place in the cap and cover with lid. 1,when you first use,Put the steel capsule into Dolce Gusto coffee machine,without coffee powder,run it,check and make sure that the capsule compatible your coffee machine. 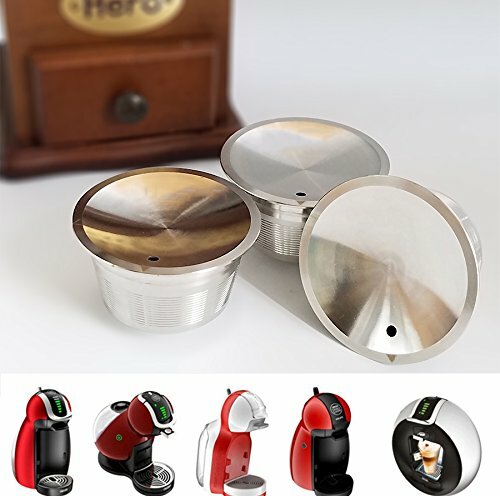 3,put the steel capsule into the coffee machine, the hole in the lid,under the "water needle", close the coffee machine. Any problem, please contact us for help. Return and Refund is accepted if required. If you have any questions about this product by Capsulone, contact us by completing and submitting the form below. If you are looking for a specif part number, please include it with your message.